The vast majority of the pearls we use are cultured, freshwater pearls. We hand select the pearls we want, based on their shape, colour, lustre and beauty. China is now the market leader in cultured pearls as they have stunningly clean and clear water which makes for the best environment for these pearls. 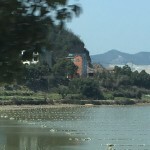 We go out to Hong Kong or China where we can talk to suppliers and choose the pearls we want. These are then shipped back to the UK. Who designs and makes the jewellery? We are a small team based in Somerset. All the jewellery is designed and made in our workshop except for a small range of stud earrings which we buy from a trusted jeweller. Most of our pieces are made to order. Often people send in pieces they have inherited to be reset, repaired or restrung. How do I get my pearls repaired or restrung? We have a repair and restringing team in our workshop. Simply package them securely and send them to us. All the details are HERE. How do you string pearls? You must use the correct colour silk thread i.e. White silk for white, pink, natural, multi-colour pastel shades, and silver grey pearls. Black silk thread for black, peacock etc. the length must be correct (including both pearls and clasp). 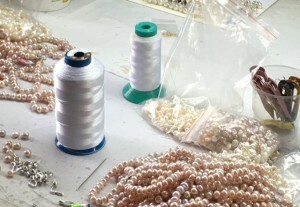 For example, for 18 inch necklace, where clasp is ½ inch long, there will be 17.5 inches pearls to make 18 inch necklace. All clasps have soldered rings so replacing clasps requires restringing first.